BMW is claiming a world first for its innovative new wireless charging system that allows its electric cars to be charged without needing to connect up to a mains outlet. The system, which enters production in July, will employ a similar system to those currently used to charge a variety of gadgets including mobile phones and electric toothbrushes. This is the first time the technology has been adapted for electric cars, which demand substantially more power than hand-held devices. 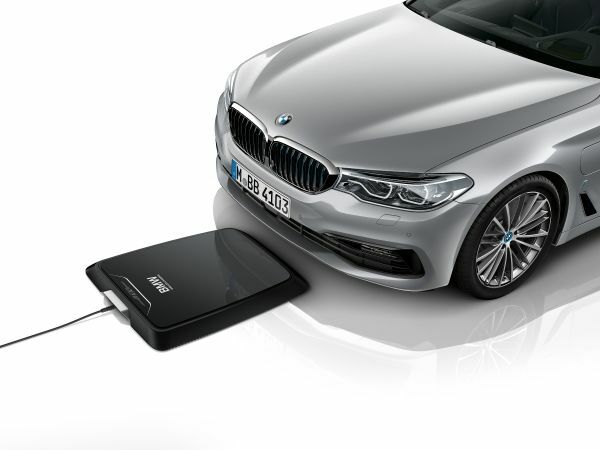 The BMW Wireless Charging pad, called the Inductive Charging Station, can be placed indoors or outdoors and a CarPad is fixed to the underside of the vehicle. BMW says that the two items just need to be within eight centimetres of each other to allow charging to commence using a magnetic field generated by the charging pad. The system also helps the driver to park in the correct position using WiFi. The in-car display shows an overhead view of the car with guidelines to enable the driver to manoeuvre into the correct location. BMW quotes a range of seven centimetres longitudinally and 14 cm laterally, so there’s no need for Formula 1 pitstop-style precision here. BMW also states that the system is full weather-proof, monitored for safety, and ambient electromagnetic radiation is limited to the vehicle undercarriage. It also offers an installation service for owners and the system will initially be available in Germany from July, with the UK following shortly afterwards, together with the US, Japan and China. Whilst the news opens up the availability of electric vehicles to many more drivers put off by the inconvenience or impracticality of having to plug in their car to the mains, it also offers exciting possibilities for future development.